My take of Scaling Scrum is that it is like Scrum on steroids – everything is magnified – the good and the not so good. Richard did a fantastic job of detailing the what, why and how using real world examples and enthusiasm. What is Scaled Professional Scrum? When multiple development teams cooperate on the delivery of a single software product, they face unique challenges: dependencies, integration issues, and quality differentials. Even if those teams are high-performance Scrum teams, the communication pathways in Scrum won’t suffice. The Scrum framework wasn’t designed to support more than a single team. 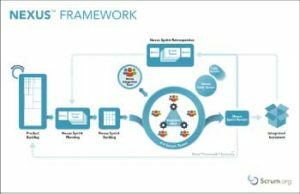 The Scaled Professional Scrum framework (a.k.a. the “Nexus”) was designed to handle these higher level functions. In this presentation, Richard will introduce the Nexus and its new roles, events, and artifacts that provide an “exoskeleton” to existing Scrum teams, enabling them to scale effectively. Even if you have evaluated or adopted other scaling frameworks and methodologies or are just starting to experience the friction of software development at scale, come and be part of the conversation.